If you are like most individuals or companies, you store all your documents, spreadsheets, PDF's, and images, in structured folders on your computer or server. If you've done a really good job, these documents are reasonably easy to find, by navigating to the appropriate folder, and looking through the file names for the one that you wish to open or print. Hopefully you have named the documents in a way that allows you to know which one you are looking for. 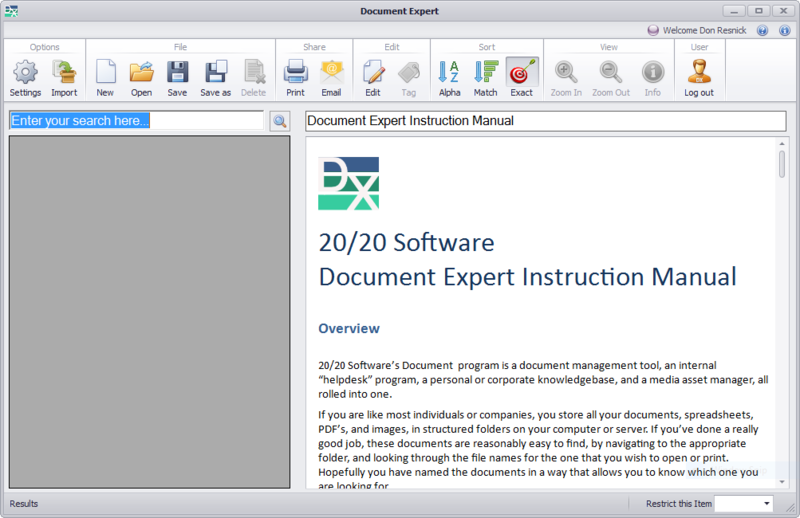 With 20/20 Software's Document Expert program, you can do exactly the same thing: navigate to the document that you're looking for and open it (or right-click and click Send To (Document Expert). The Document Expert program will display the document - and allow you to edit it or print it - just as though you were using various types of document- or image-editing software (Word, Excel, Acrobat, PhotoShop, etc.). However, by clicking the SAVE button, Document Expert will automatically fully index the content of the document – making it searchable by typing any word, words, or phrase that you can think of to find the document. In addition, if your documents are not well organized, Document Expert will organize them for you in a default set of folders. 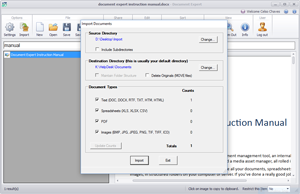 Document Expert also comes with Microsoft Word and Excel plugins that allow you to work directly in Word or Excel, and index the content using Document Expert's advanced indexing features. From then on, the document will also be available in Document Expert as well as Word or Excel. Click on the button below to download Document Expert for Windows 30-day trial. Although you may add documents to Document Expert one at a time, you will more likely want to import existing documents in batch. Document Expert has a powerful import tool that allows you to import any number of documents, spreadsheets, PDF's, and images -- and will fully index them during the import process. You can also choose to move the items from scattered locations in your system to an organized single location. Document Expert not only manages and indexes external documents, but it also supports plain text notes that can quickly be added and fully indexed. Adding notes is as simple as typing a title and a note of any length. These can often act like questions and answers, or FAQ's. The number and size of notes is unlimited. Document Expert also keeps a detailed history of all documents -- external and embedded -- telling the name and type of document, as well as the date first entered or imported into the system, and the dates of all edits done on the documents. 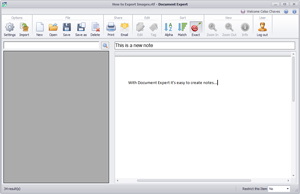 The Personal version of Document Expert can be run in Anonymous mode. The Professional and Enterprise versions support mutliple users, defined rights, restricted documents, and Anonymous users (usually "Readers") as well. 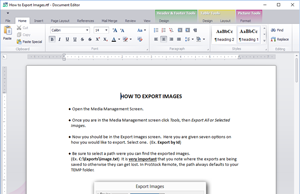 Document Expert contains a fully functioning Word Processor, Spreadsheet Program, and Image Editor. Right from within Document Expert you can create and modify these types of documents or media. Changes to documents are automatically indexed when you save the document. New documents are automatically indexed when you save them. The convenience and power of embedded document and image editing functionality is a powerful addition to Document Expert.